Last week we spent some days plowing through one of the most important areas of tropical rainforest in Borneo, central Kalimantan’s Sabangau, looking for Orangutans, gibbons, Langurs and other primates as well as learning about the ecology of the peatland habitat. For two days we started at 4:30 am in the dark, wearing headlamps, looking for the elusive apes. Although boards (built on a former logging railway) run for some kilometers through the 45-hectare grid within which the researchers we were visiting spend most of their time, much of the forest walking was through deep peat swamp that occasionally reached mid-thigh! 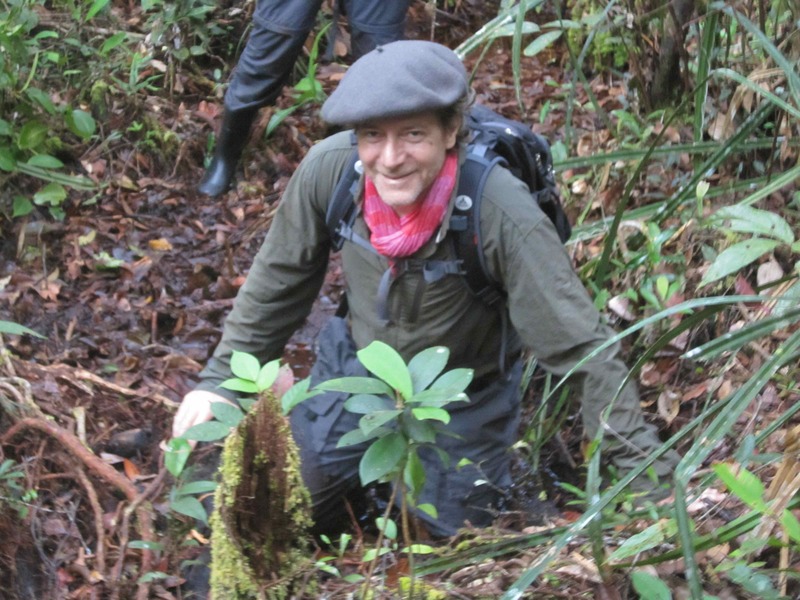 See the photo above of intrepid ADM Capital partner Robert Appleby taking the measure of the peat’s depth! The walk, more often a run, as over hours we chased to reach the spot where a gibbon grouping or orangutan had been spotted by the Dayak or foreign teams working the forest, was often a challenge but incredibly rewarding nonetheless. Seeing the majestic creatures in the wild was truly breathtaking. The gibbon photo above was taken by the OuTrop crew. We were visiting Oxford Primatologist Dr. Susan Cheyne who along with other senior wildlife conservationists leads a team of young researchers working out of an old logging camp situated in the designated Sabangau “Natural Laboratory” about an hour and a half by road, boat and foot from Palangka Raya. The Laboratory sits within the 500,000 hectare Sabangau National Park, which actually is not yet officially a national park. This year ADMCF has provided support to Dr. Cheyne through Oxford University’s Wildlife Conservation Unit (WildCRU), which also backs the conservation and research effort. Dr. Cheyne and her team monitor the distribution, population status, behaviour and ecology of the forest’s primates, carry out biodiversity and forestry research, and work with local partners to implement conservation solutions. The team is sponsored in Indonesia by the Center for International Cooperation in Sustainable Management of Tropical Peatland (CIMTROP), which is responsible for conservation of the important 50,000 hectare peatland forest. That involves mostly ranging and firefighting, although there is also an ongoing effort to dam the many canals built through the forest that were used to transport the illegal logs to the river and are now drying up the swamp. Estimates are that the peatland, as deep as 19 meters in some spots, is sinking with the lowered water table and this of course threatens the trees and amazing wildlife, which is just beginning to recover from logging. Sabangau was turned over to conservation in the late 1990s after Orangutan Tropical Peatland Project (OuTrop) research managed to document the incredible biodiversity of the forest and establish clear records of substantial populations of primates, clouded leopards and other endangered species. Previously Sabangau was a logging concession, although luckily it was only selectively cut. More destructive though was the illegal logging that followed in the late 1990s – when the canals were cut through the swamp and more of the forest was chopped. Still, the research team has shown that surprisingly primates are returning to the peatland forest, which also has regenerated well. 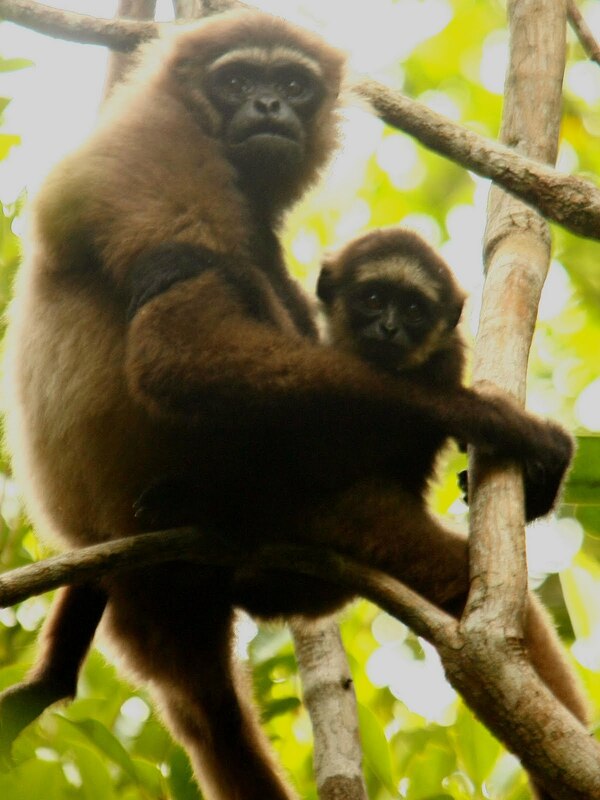 Estimates are that the Sabangau previously hosted populations of about 14,000 orangutans and 40,000 gibbons and now numbers of each are at about half that amount, according to Dr. Cheyne. Along with Dr. Cheyne, two other senior OuTrop primate researchers work from the Setia Alam camp: Simon Husson and Helen Morrogh-Bernard, who were among the first to identify the orangutan populations in Sabangau and set up the camp with CIMTROP early last decade. 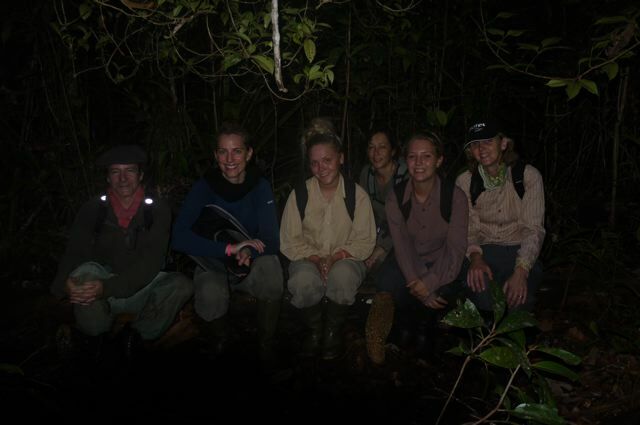 OuTrop has been excellent at attracting paying volunteers and research interns to help survey the primates and biodiversity in the peat forest. Each individual seems to play a strong role in helping to build a portrait of the unique ecology of Sabangau. Certainly, more help is always needed for this important work, which is critical to inform conservation and indeed learn about the behavior of the animals. To illustrate the importance, previous research establishing that the populations of apes lived in the forest was enough to persuade the Indonesian government that the area should be conservation forest. Now, new research is showing that adult male orangutans might need much larger range areas than previously believed, while gibbon family groupings perhaps also need more dispersal space in order to establish healthy populations. 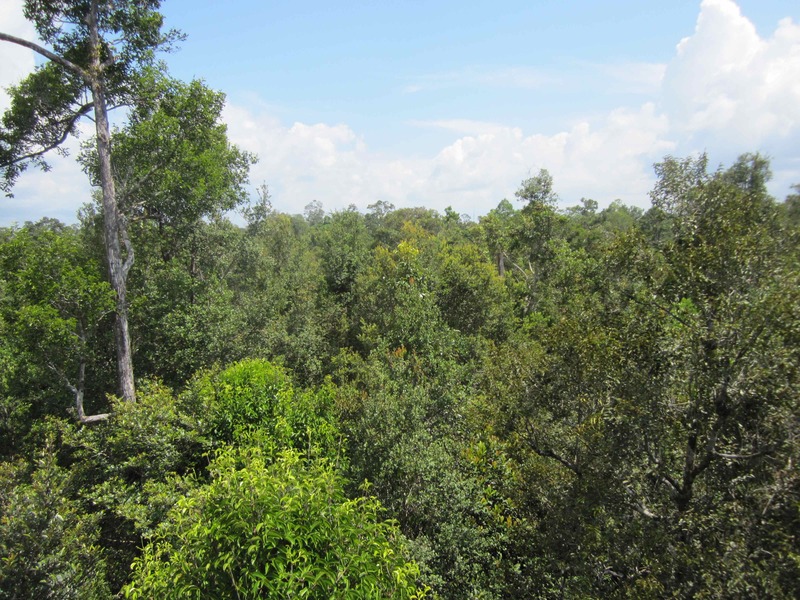 The teams also believe that because food (flowers and fruits) in the acidic peat swamps is not as plentiful as in regular tropical forest, apes may develop sophisticated mental maps of so-called “destination trees” and return to these in season to maximize their travel efficiency. The concern is that if these large feeding trees disappear so will the feeders. Out of curiosity, we visited Block C of the Mega-Rice project. Which was indeed a sorry sight: So many kilometers of barren land subject to annual and devastating fires on the peatland where nothing now grows but scrub. In the last days of the Soeharto era, Indonesia’s corrupt leader apparently handed logging concessions equal to about 1.4 million hectares to two sons and declared an ambitious plan to convert the Kalimantan peatland forest into rice padi, to be farmed by migrant workers from Java. The idea was to make Indonesia self-sustainable in rice production. But the Project was a failure because acidic peatland was completely unsuitable for growing rice. Huge canals were built in the peat, ostensibly to control water-levels but instead drained the once-flooded swamps. Of course, the sons profited handsomely from the logging concessions, which many believe was the real motivation behind the Project. In a major drought in 1997 the peat dried out entirely, caught fire and burned for months. This resulted in a smoke haze that covered much of south-east Asia and released huge amounts of carbon dioxide into the atmosphere. Burning forests in Indonesia are largely responsible for the country’s designation as the world’s third-largest emitter of greenhouse gases. The former Mega-Rice area continues to burn annually during the dry season and is considered one of the world’s biggest environmental disasters. 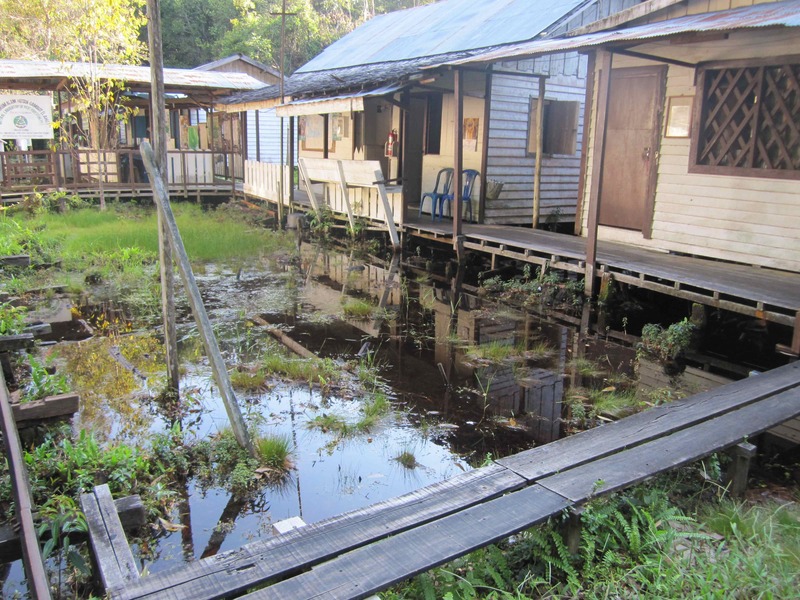 Luckily the Project was stopped before the Sabangau Forest itself was drained and cleared.